A tooth socket holds the tooth in place by connecting its roots to the underlying alveolar bone. After a tooth is pulled, a blood clot forms over the socket to protect the bone and nerves underneath. Dry socket also known as alveolar osteitis is a common condition occurring few days after an extraction where the clot becomes dislodged or dissolves. It attracts air, food, fluid and almost anything that enters the mouth which leads to bacterial infection and results in severe pain. Dry socket delay healing of surrounding tissues and alveolar bone. 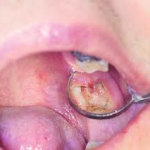 Higher incidence of dry socket occurs after removal of impacted mandibular third molars followed by upper molars, premolars, canines and incisors. It occur twice more often after single tooth extractions when compared to multiple extractions completed at the same time. It occurs in those around the ages between 20 and 40. How to Identify a Dry Socket? 1. Moderate to severe localized pain near the extraction sites 4-5 days after extraction. 2. 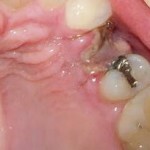 Decreased discomfort at the extraction sites on the immediate next day with sudden worsening of the pain. Pain is characterized as dull aching, throbbing pain radiating to the ear. 3. A bad odour and taste may or may not be present. 4. Examination reveals an empty socket, exposed bone surfaces and absence of blood clot. Fibrinolysis is the breakdown or failure of normal clot formation due to high levels of fibrinolytic or proteolytic activity in and around the blood clot. 1. Surgical or traumatic extraction. 2. Mandibular extraction, especially third molars. 3. Patients with poor oral hygiene. 4. Female patient, especially on contraceptive medication. 5. Infection or recent infection at the site. 7. Periodontal disease or acute necrotizing ulcerative gingivitis occurring elsewhere in the mouth. 8. Young adult to middle-aged patient. 9. Previous history of dry socket. 10. Excessive usage of local anesthetic agent, vasoconstrictors prevent formation of blood clot. 11. Local bone disease or radiation to the head neck reducing blood supply for clot to form. 12. Patients with uncontrolled diabetes mellitus should be monitored carefully. 13. Drinking with a straw, excessive rinsing and spitting after extraction. What You Should Do to Prevent Dry Socket? a)	Using an antimicrobial mouth rinse to rinse both before and after an extraction procedure such as chlorhexidine gluconate 0.2 %. b)	Betadine mouthwash is another alternative which decreases the bacterial load prior to surgery. c)	Placing a topically administered antibiotic within the extraction site immediately after an extraction is the most widely used method. Tetracycline and clindamycin are the most commonly used antibiotics after a third molar surgery. d)	Place a moist gauze over the extraction socket and bite firmly into position to control bleeding and encourage clot formation. Change the gauze when needed. e)	Avoid forceful spitting, heavy sneezing and drinking with a straw as it creates a positive or negative pressure enough to dislodge the clot. f)	If bleeding continues, place a moisten tea bag with water and fold it in half and bite down gently for about 30 minutes. g)	Avoid brushing near the extraction site for 3-4 days as it may cause a new episode of bleeding. h)	Do not take spicy foods or hot drinks as they provoke bleeding. i)	Avoid sticky foods on the first two days as they tend to pull away the clot. Soft diet of soups, mashed potatoes and high caloric drinks and fruit juices are helpful. j)	Keep your head elevated during bedtime, keep fingers and tongue away from the extraction site. k)	Do not smoke as the sucking motion can dislodge the blood clot and avoid alcohol as they delay the healing process. Proper hygiene is essential to a healthy recovery. With pain centering around the site of extraction, you may take aspirin or ibuprofen to relieve the pain. These anti-inflammatory and analgesic drugs are available over-the-counter. Do not curette the socket as it will expose more amount of bone and worsen the pain. Do not ignore the pain and visit your dentist to seek help if the pain worsens. Your dentist will perform the necessary treatment such as removing debris from the socket and placing a medicated gauze to promote healing. There will be an instant pain relief from pain within 5 minutes. You will need regular dressings until the pain reduces and socket starts healing. Antibiotics maybe prescribed to prevent the socket from becoming infected. Your duty is to rinse with a warm salt water rinse or mouthwash 4 times daily.